Discussion in 'Replica Props' started by dr_slurpee, Nov 14, 2005. 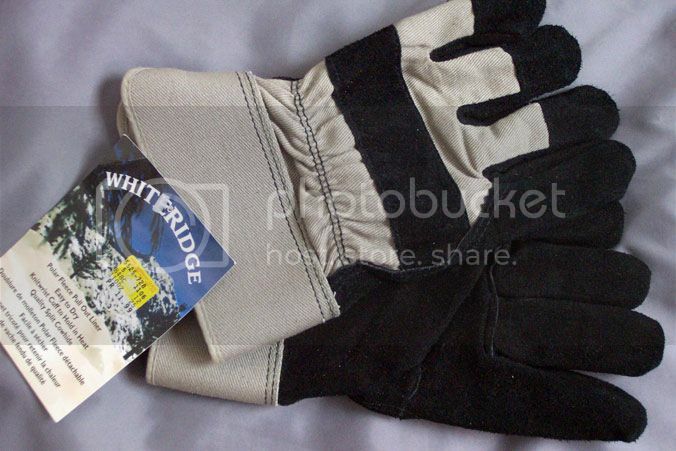 Has anyone found a source for the right colour work gloves for to make some of Jayne's gloves from Firefly? I will have to find a pic to post, or if someone else has a pic handy feel free to post it. Thanks for posting the pics Angelus. I have looked around at the places near me but not found any that colour yet, they are all red and such, or have stripes on the wrist portions, or are red with stripes on the wrist portions...you get the idea. By the way, what is that last pic from? What's the full pic look like and is there a larger version? I flipped it since the original was backward. That would rock Angelus. Email is john @ name-brand.net (remove spaces of course). Where does everyone find all these nice pics? Yeah the gloves are your standard leather palm work gloves, finding the right ones has been tricky, at least for me anyway. I have done some googling for leather work gloves... the closet I have found are ones called "double leather work gloves"
Amish, I did some of the same last night but still found gloves with stripes or entirely the wrong colour. I suppose the possibility is that this colour glove is no longer being produced. I found a couple of pair that have white cloth and light gray leather. I suppose if needed, you could always dye them. Angelus that might be an idea, but I imagine it would be hard to impossible to dye them well. How many pairs do you have? Perhaps I could buy one from you? Bringing this thread back from the dead for those that might be interested. I stumbled across a pair of gloves that are the closest I have seen. The only REAL difference that I can see is that mine have black stitching instead of white. The colour looks more tan-ish in my photo but in real life they are a grey-ish tan. I found them in a store called Home Hardware, not sure if they are Canada only. They were on clearance cause they no longer carry them. Unfortunately they only had one pair of large and 2 pairs of XL. I grabbed the large. Dunno if any other Canadians can check their local Home Hardware to see if they have any. Oh, they also came with a removable fleece liner glove. So Close... Anyone else got any new leads? Wrong color scheme, but right on. "Furniture leather gloves" are the right choice to search for? SUPER CLOSE - wrong stitching, but darn good alternative. I think the furniture leather gloves all have shiny leather on them. I think the right types to look for are split leather palm work gloves. What kind of gloves did Jayne wear in the movie Serenity? I blieve someone had posted what they were at some point. If memory serves me they are some form of martial arts gloves, or kick boxing gloves, or something of that nature. Yup. Sounds right. Thick and padded they be, argh.